An outline sketch of a denomination that is one of the foremost in the metropolis - past history and its present prosperity, its many fine churches and its notable leaders of religious thought. It was not until the second century of New York's history that the Presby­terian church, as a church, was estab­lished within the limits of the metropolis. Dr. Briggs has traced and recorded several earlier occasions when pastors of the denomination visited Manhattan Island­ - the earliest in 1643, when the Rev. Fran­cis Doughty came there from the Massachusetts colony; but 1706 is the com­monly accepted date for the beginning of regular services after the Presbyterian form of worship. Even then the worshipers - a few families from New England and from the mother country - had no ordained head. Nor were they wholly free from persecution. Nominally, at least, religion had always been free in New York, but in 1707, when the Rev. Francis McKechnie came from England and was about to hold a Pres­byterian service in the old Dutch chapel on Garden Street, he was stopped by the governor, Lord Cornbury, and a few days later was arrested as a disturber of the pub­lic order. This was the last display of offi­cial hostility, however. In 1716 the congregation, then newly organ­ized as a part of the Philadelphia presbytery, was allowed to hold services in the City Hall during the building of its own house of worship. This first Presbyterian church, which has long since dis­appeared, was in Wall Street. A second, rendered necessary by the congregation's growth, stood at the corner of Beekman Street and the Boston Road- the present site of the towering Times office - and was called the Brick Church, in distinction from the parent edi­fice, which was of stone. 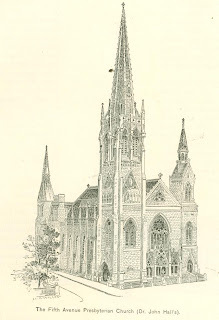 For more than a century - a century that began before the Revolution and ended after the civil war, that saw thirteen struggling colonies become earth's mightiest republic, and the village on Manhattan Island grow into the metropolis of the New World - the pulpit of the Brick Church was filled successively by two of the most remarkable figures of the de­nomination's history in New York. The first of these was Dr. John Rod­gers, the friend of Washington, whose ardent adhesion to the pa­triots' cause was punished by the dismantling of his church during the British invaders' armed occu­pancy of the city. 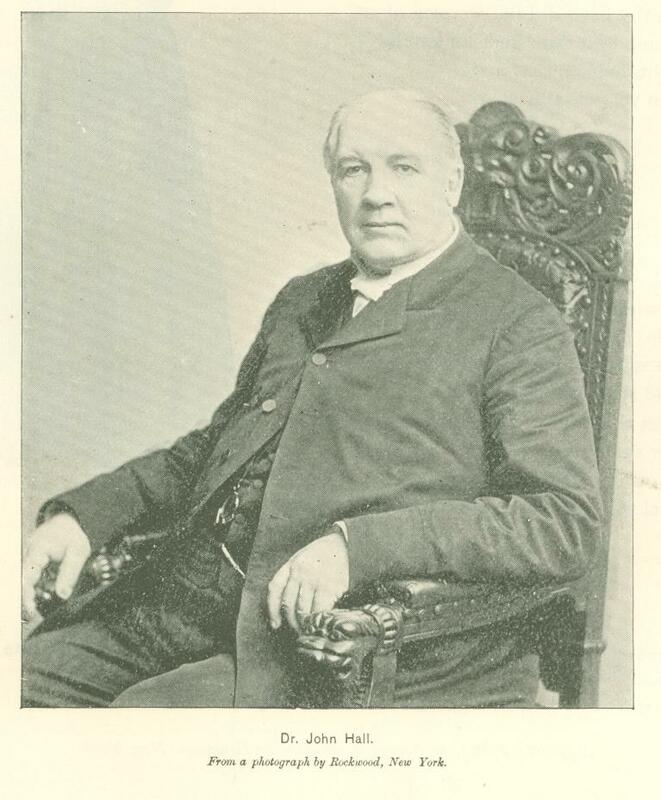 The second was Dr. Gardiner Spring, who died in 1873 after a memorable pastorate of sixty three years. It was Dr. Spring who in 1858 abandoned the old building on Beekman Street, and following - or rather leading - the northward ad­vance of population, re-erected the Brick Church at Fifth Avenue and Thirty Seventh Street. Following his death there came frequent changes in the church's pulpit and some declension of its prosperity, which has, however, been fully restored under the present pastor, Dr. Henry van Dyke. With the culture of Princeton. the Union Sem­inary. and the University of Berlin. Dr. van Dyke is known as a writer as well as a preacher. as an active sympathizer with all movements for reform. and as one of the foremost advocates of "a broader, simpler, and more practical creed for the Presbyterian church." In the days of the old Brick Church. just after the Revolution, it was the cus­tom after service to take up a collection in tin platters, upon which each member of the congregation placed a copper penny. Penny contributions are no longer the rule of the Presbyterian church. In New York it is notably the church of the wealthy. Its annual revenues may be set at a million dollars. It stands high socially and intellectually. It is strongest in the finest residential districts of the city. It spends great sums in charities and missions, and among its sixty church buildings are some of the finest in the metropolis. Finest of all is the Fifth Avenue Church, whose tall Gothic spire is a conspicuous landmark at the corner of Fifth Avenue and Fifty-Fifth Street. Its pastor, Dr. John Hall is one of the famous men of the denomination. He was born in the north of Ireland, of Scottish lineage sixty four years ago, and had made a great reputation in the pulpit of a Presbyterian church in Dublin when he was called to New York in 1867. To his power in speech and action the church built under his ministry, and it's great and steadily growing congregation, are striking testimonials. The latter has a membership of twenty five hundred, and its benevolent zeal may be instanced by the fact that it re­cently voted $160,000 for a new mission house in a poor and crowded district of the east side. Next to the Fifth Avenue church in the extent of their membership are the Central, on West Fifty Seventh Street, and the Fourth Avenue. To the former, which was President Cleveland's church during his residence in New York, Dr. Wilton Merle Smith came as pastor four years ago from the First Presbyterian Church of Cleveland. Dr. Smith is a young and well equipped minister, a graduate of Princeton and the Auburn Seminary, and a son of Judge Boardman Smith of the New York Supreme Court. The latter is best known as Dr. Howard Crosby's church, so long and so thoroughly was its late pastor's individuality impressed upon it. His recently installed successor, the Rev. John R. Davies, is a man still young, the story of whose career gives earnest of great things to come. Born on the borders of England and Wales, he came to America a penniless boy, whose first employment was in a Scranton iron foundry. He struggled hard to secure an education, and succeeded in working his way through Lafayette, where he gradu­ated with honors, and through the Prince­ton Seminary, earning his own support while he studied. In the pulpit of the Presbyterian church at Tyrone, Pennsyl­vania, he showed gifts that attracted at­tention, and led to the call to his present important post. The Central and the Fourth Avenue Churches are nearly equal in age. The one dates from 1821, when it was organ­ized by the Rev. William Patton, with but four members, who met in a room on Mulberry Street. The other began its existence four years later, its first build­ing being on Bleecker Street, whence it moved to its present site, at Fourth Avenue and Twenty Second Street, in 1854. Two Presbyterian churches that stand among the most important of the denomina­tion are Dr. Parkhurst's, the Madison Square, and the West Church, just left pas­torless by the resignation of Dr. Paxton. Dr. Parkhurst's name has become widely known through his daring leadership of a new civic cru­sade. He is as able and force­ful as he is original. He was born of Puri­tan stock at Framingham, Massachusetts, fifty one years ago. After graduating at Amherst he studied theology in Ger­many, and returned to America to be­come a teacher, and afterwards pastor of a Congregational church at Lenox, whence he came to New York thirteen years ago. Dr. Parkhurst is an erudite scholar. His first published writing was upon "The Latin Verb Illustrated by the Sans­tkrit;" but in later years he has turned from dead languages and patristic litera­ture to the practical and the contempo­rary. With the retirement of Dr. John R. Paxton, due to impaired health, the de­nomination loses perhaps its foremost pulpit orator. 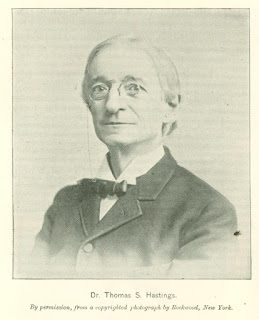 Of Dr. Pax­ton's life and personality a sketch appeared in MUNSEY'S MAGAZINE two years ago (November, 1891). 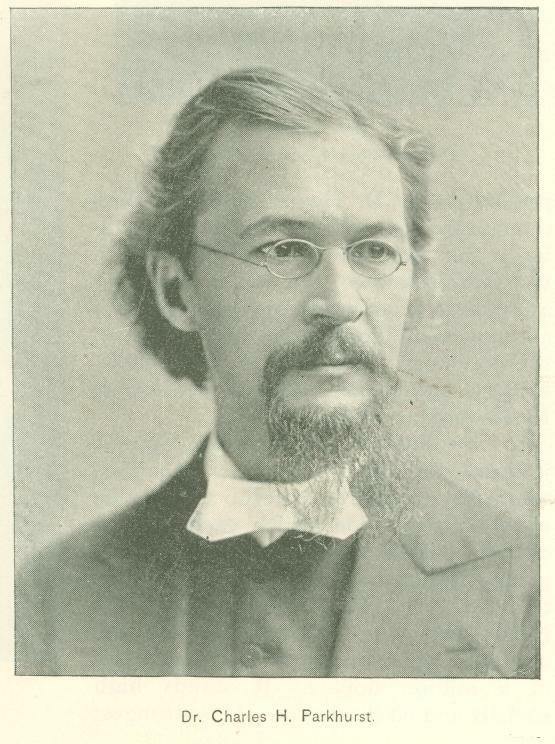 His suc­cessful ministry at the West Church, whose handsome entrance fronts upon Bryant Park, began in 1882, when he came to New York from Washington to succeed Dr. Thomas Hastings, who had been elected to a chair in the Union Seminary. The Presbyterian church is notably well represented in the new residential dis­trict west of Central Park. To three important churches in that quarter - the Rutgers Riverside, the Park, and the West End - there is now being added the beautiful structure which the Fourth Church - Dr. Joseph Kerr's ­is building at the corner of West End Avenue and Ninety First Street. The West End Church, at Amsterdam Avenue and One Hundred and Fifth street, was conse­crated only twenty months ago. The congregation was organized in 1888, with a newly graduated student from the Union Seminary as its head. His leadership has been so suc­cessful that today his church ranks among the four or five largest of the denomi­nation in New York, reckoning almost a thousand members - one of whom, it may be mentioned, is Dr. Briggs. This is a remarkable five years record for a man who was in his twenty eighth year when his ministry began, as was John Balcom Shaw. Last year, when he received the D.D. degree both from his own alma mater, Lafayette, and from Hamilton College, it was said that he was the youngest divine who had ever been so honored. Of the Park Church Dr. Anson P. Atterbury has been pastor for the past fourteen years. Numerically the congre­gation is a comparatively small one, but its new building at the corner of Eighty-Sixth Street and Amsterdam Avenue is one of the finest Presbyterian churches in the metropolis. The Rutgers Church, at Seventy-Third Street and the Boulevard, is also a hand­some though not a very large church, its basilica-like interior being particularly noticeable. Its name was taken from Colonel Henry Rutgers, who almost a century ago gave land for its original building upon Henry and Rutgers Streets. Thence the congregation migrated to Madison Avenue and Twenty-Ninth Street. Its fortunes were at a low ebb when, nine years ago, Dr. Robert Russell Booth Was called to its head and guided it to the field it now successfully occupies. Dr. Booth is one of the veteran leaders of Presbyterianism - born sixty three years ago in New York, and educated at the Auburn Seminary and at Williams College, of which latter he is now the senior trustee. For many years he was pastor successively of the old Mercer Street and the University Place Churches, the latter becoming under his ministry one of the most important bodies of the denomi­nation. III health forced Dr. Booth to leave it. He went to Europe, and returned with strength to undertake a new pastorate at the Rutgers Church. 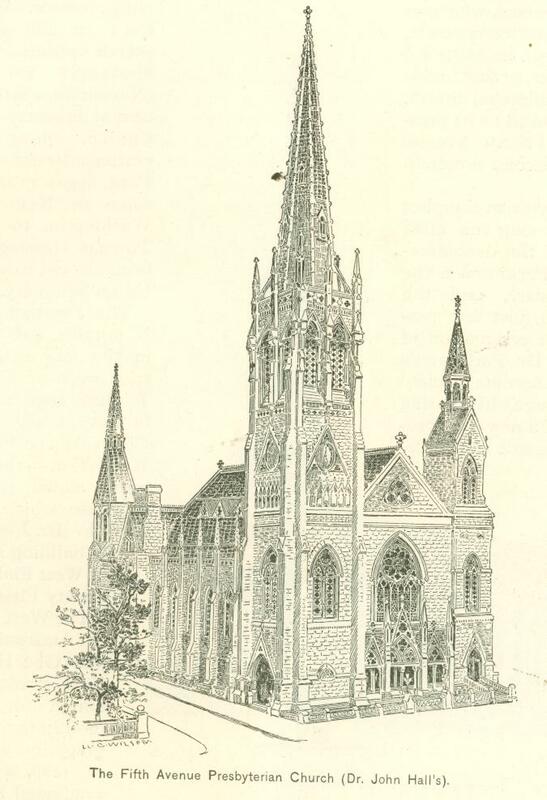 Another is the Madison Avenue Church, at Fifty-Third Street, whose head, Dr. Charles L. Thompson, came to it after occupying several important pulpits in the West, besides the editorial chair of a religious journa. Dr. Thompson's is one of the few Presbyterian churches that have made all their sittings free, and it is his purpose to make it " the People's Church." Then there is the First Church (Dr. Howard Duffield's) upon lower Fifth Avenue, a successor of the old church in Wall Street; the Church of the Covenant (Dr. James H. McIlvaine's) at Park Avenue and Thirty-Fifth Street; the Harlem Church (Dr. Ramsay's) upon One Hundred and Twenty-Fifth Street, near Madison Avenue; and several others of almost equal importance. Nor can mention be omitted of the Union Theological Seminary, at Fourth Avenue and Sixty-Ninth Street, which is still the foremost training school of Pres­byterianism, in spite of the "strained relations" that have come between it and the official power of the denomination. With such a leader as its president, Dr. Hastings ­already mentioned as Dr. Paxton's predecessor at the West Church - and such men to fill its chairs as Dr. Briggs, Dr. George Lewis Prentiss, Dr. John Hopkins Worcester, Dr. Marvin Vin­cent, and Dr. Francis Brown, it is hard to see how it can fall from its position. Into the controversies that have brought about the issue between the Union Seminary and the govern­ing body of the church it is impossible to enter here. It has always been a char­acteristic of the Presbyte­rian church to fight out its battles with the zeal and keenness of the old refor­mers. It is no new thing for it to hold, as it does to­day, two schools of doc­trinal thought. It is a symptom not of approach­ing extinction, but of abounding intellectual life, which not even a disrup­tion like that of 1741 or that of 1837, should it actually come, can dissipate or extinguish. It may be said that Pres­byterianism in New York, at its beginning, was an offshoot from Philadelphia and from New England, where it was already strong. In the latter its place has since been taken by the Congregational system. In the former it has maintained and increased its strength; but though in point of numbers the Philadelphia presbytery stands first among the divisions of the church, that of New York today excels all others in material wealth and importance as well as in intellectual activity and emi­nence. Originally published in Munsey's Magazine. December 1893.